Welcome and Enjoy! I'm a huge CFL fan. With the Grey Cup this weekend, and the unveiling of the newly named Atlantic Schooners, I thought it would be a good time to unveil what I've been working on for quite some time now. Using this site,Trucolor.net, and fan opinions, I tried to put together how I believe the CFL would look if I were in charge...and could only use paint. I start alphabetically, with the Atlantic Schooners. Atlantic Schooners Thanks to @BenjiJ for cleaning up this logo. The Schooners have just been announced as the team name for the new team set to play in 2021. Flashback to a couple of months ago while I was on and off while working on this project, I took the color codes from Trucolor and logo of the original team and put my spin on how the failed attempt at bringing football to the Atlantic Coast of Canada would look today if they had played. Uniforms: Home and Away: Alternates: I hope you all enjoy the beginning to this thread. Well, after seeing @FinsUp1214's MLB series, it got me inspired to make concepts again. I've tried to learn other art programs, but I always end up getting flustered, so I've chosen to stick to what I know for this series: MS Paint. Anyways, the 1st team: The Anaheim Angels. Seriously, the "Los Angeles" & "of" aren't needed at all. For the Angels, I wanted a set that was different but also showed history for the team. I decided to use the 1971 logo as the basis for the concept as I've always adored that logo. The jerseys themselves are a blend of the 1960's, 1970's, The "Angels In The Outfield" set & the 2007-Now jerseys. 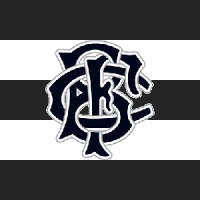 As for each colour, it's a blend of RBG values from each era that creates the Navy (They've used 3 different shades), Grey (2 variations, but also mixed with the light blues used by the team during the 00's) & Red that these Angels wear. I also feel like the Angels are a team that can pull off dressing in various setups, so I gave them 3 hats to wear. I also decided Navy was best to use on the Road given their love of using the current reds at home. Let me know watcha think & maybe give me a suggestion on who to do next. P.S. Does anyone know if I can get any MLB fonts somehow? I can't seem to find any. Hey everyone. I used to be known as The NSL on these forums years ago. When Colours of Football had a forum, I went by my real name. This thread will serve as a general works section for me. Most of what you'll see will be on Paint, since I've been used to doing it, but will have occasional sketches and stuff on more advanced programs like Adobe Illustrator. Ultimately, this would be considered a self-motivational thread, since I feel I've lost touch with design, and want to get back into it. I previously had a thread here from 2008 to 2009, The NSL's WTF Thread. But here I am, nearly 9 years later, new username, a lot calmer. Most of the works here on this first post will be COF Paint+ works done from November 2009 until the closing of the forums. Continuing on my take on MLS clubs from the end of the WTF Thread continued with an Umbro Vancouver Whitecaps take. A VfB Stuttgart home concept, with PUMA. A Southampton away kit with Umbro. A Racing Santander away kit with SLAM, for a contest. Continuing the MLS concepts, there was the first version of the DC United entry, with shades of techfit. Hey all This is my first post and this is a little something I did in Microsoft paint. I recolored the Mariners logo and replaced the teal with more of a bright green. The 2 logos in the top right are the cap logos, couldn't decide which would fit better. Feedback would be much appreciated! Hi, everyone! This is my first-ever post here in the CCSLC. As the title suggests, I have made NFL concept uniforms in Paint. The template that I used is Nike Mach Speed. I based that template from one of the Paint-friendly football templates here in the forum. Credits to Conrad Burry and Eriq Jaffe for the fonts. Anyway, here are the links (newly added concepts are in bold): AFC East: Buffalo | Miami | New England | NY Jets North: Baltimore | Cincinnati | Cleveland | Pittsburgh South: Houston | Indianapolis | Jacksonville | Tennessee West: Denver | Kansas City | Oakland | San Diego NFC East: Dallas | NY Giants | Philadelphia | Washington North: Chicago | Detroit | Green Bay | Minnesota South: Atlanta | Carolina | New Orleans | Tampa Bay West: Arizona | Los Angeles | San Francisco | Seattle Please comment after viewing my concepts. Thank you! Looking through Paint Users Paradise I found a football jersey template I made a few college football concepts. Alabama Simple design for the Tied. Can't change much. Added "Roll Tide" to back collar and sublined Alabama flag to the sleeves. Next up is Bama's runner up! I decided to take a little brake from my NFL series to try rebranding Air Force. I actually almost joined a few months ago to post an Air Force concept. But before I did, I got some feedback from my brother, who told me that if he had to wear that, he'd quit the team. Quite frankly, I agreed. It was a pixelated mess, and it wasn't anything I thought I should even try posting. Then almost a month ago I cleaned up a couple concepts and decided to join. Now, after seeing BrandMooreArt's concept, I decided to give another shot at Air Force. I made my own logo, made sure it was completely clean, and decided to post it. First are the logos. Primary: Wordmark: Air Force has a mess of an identity. Their primary logo is a generic "AF", the team name is the Falcons, yet they use a lightning bolt on the helmet. This is meant to fix that by eliminating both the falcon and the lightning bolt. The primary mark is based off the roundel of the USAF, and the secondary logo is really there just so I could justify using it on the uniforms . Anyway, here are the uniforms: The uniforms are pretty self explanatory. The helmets feature the logo on one side and the number on the other. The sleeves have the logo on a double stripe. The number font is the "USAF Ararmillo" font I found on dafont.com, and yes I realize it is the same font BrandMooreArt uses in his concept, but it is an official USAF font (used on their aircraft) and it's the only official USAF font I could find, so I went with it. Then of course, the Thunderbird alternate: This alternate could be considered a Pro Combat. Of course, it based off the Thunderbirds, F-16s that are dressed for an air show. I used the blue-red striping a lot, but my favorite use of it is on the helmet, to resemble the nose of the plane. Then finally, the field: It's a pretty plain field. I didn't want anything drastic, because unless your Boise State or Eastern Washington, the field shouldn't be the center of the show of your home games. That's all I have. It's my first complete rebrand, and I don't feel like I did too bad on it. I didn't go too uncreative, either. If there's anything that bothers you about it, please let me know. But if not, enjoy! The Poor Man's Guide to Logo Design: How to Create Logos Using Programs Already Installed on Your Computer by Eagle98 Far too often, I have seen people post sub-par concepts on here and then when they are given criticism use the excuse that they are using Paint. I am in no way accusing anyone in particular of doing this, but it’s really not a valid excuse, and I think the problem is that people don’t know how powerful programs like Paint can be if used properly. My personal recommendation is to move past Paint to something like Inkscape (or maybe Gimp). Both are completely free to download and are powerful tools. They do require a little while to learn, but they get easier to use with time. However, for whatever reason, some people can’t or don’t want to use these programs and stick with Paint. I am planning on posting a series of tutorials (with no sort of regularity) on how to use programs pre-installed on most computers (mainly Microsoft Paint and Microsoft Word) to create logos and uniforms. It is possible to create top-notch concepts with Paint. (People like oldschoolvikings do it all the time.) Before I begin, I want to say that I am not looking for feedback on my concepts. I understand that there is much that I could do to improve them. However, this concept serves only as an illustrative example of what can be done with free tools such as Paint and Microsoft Word. I've wanted to try some concepts on Paint for a while now, and I decided to give it a shot. I decided to do the Jacksonville Sharks of the AFL. I didn't get too creative with this one, basing it off of this version with some minor edits. Again, I didn't get too wild since it's my first concept. I may do an entire AFL makeover and go with some more crazy designs. C&C welcome. Let me know what you all think. First off, thank you to lightning25 (wherever you are) for your basketball court template for Paint. NOTE: THIS SERIES IS FOR MID-MAJOR TEAMS...I think it's time somebody gave them the shine they deserve. #1 St. Francis Brooklyn Terriers To begin with, I picked the Catholic school in a borough I've always been fond of. The St. Francis Brooklyn Terriers are one of two Division I college basketball programs in New York City's largest borough (the other being conference archrival the LIU Brooklyn Blackbirds, who meet twice a year in the Battle of Brooklyn). Their current gym, the Lynch Gym at Generoso Pope Physical Education Center (often called "The Pope"), has character, but IMHO is WAY TOO SMALL at a capacity of only 1,200. Therefore, my design had them moving to the Barclays Center for more high-profile games (smaller ones still being at The Pope). As far as the color scheme goes, I stuck with The Pope's pattern (blue sides, red paint), however, I put the "BROOKLYN ST. FRANCIS" wordmark in front and center (similar to the Nets' "Brooklyn New York" logo placement). As for the court, I named it after Dennis McDermott, who played for the Terriers from 1971 until his graduation in 1974, held the team's all-time scoring record, and whose number 22 remains the only retired uniform number in school history. Of course, I didn't want to leave the Terriers part out, so I put the side-facing dog's head inside the paint between the 3-point line and the key. All C&C is greatly appreciated...next up will either be another NEC team or a MAAC team (suggestions welcome). As a twelve-year-old in 2000, I would often imagine my own fantasy football teams and the league which they were part of. For about five years it was a pet project of mine, with expansion getting so large the championship game ended up being between Eastern and Western Hemispheres (I think Pakistan beat Lehigh Valley in the very last one). At that point, I simply decided it was getting too hard to follow, so I stopped. However, I have made an attempt at recreating them onto Paint concepts for this board. (WARNING: Clipart and other copyrighted images were the basis of my drawings, so they will be seen here. Please don't complain-I claim no ownership of these, and the teams I post are just for fun). So, without further ado, here is the Rebellion Football League. I'll start with the original 20, and then go on to the "expansion years"-there was PLENTY of it. Notice the original cities are kinda random, and my small hometown is in the lineup. EASTERN CONFERENCE Atlantic Division New Jersey Wolfpack New York Skyliners Orlando Lightning (finished 8/27) Philadelphia Stars Washington Eagles Central Division Chicago Cattle Columbus Voyage Detroit Engine Louisville Blues (finished 8/26) St. Louis Surge WESTERN CONFERENCE Midwest Division Houston Galaxy Minnesota Bobcats Racine Vipers San Antonio Outlaws Sioux Falls Scavengers (finished 8/25) Pacific Division Arizona Javelinas Hawaii Tribe Los Angeles Smoke San Jose Motion Seattle Seals Scavengers up first!